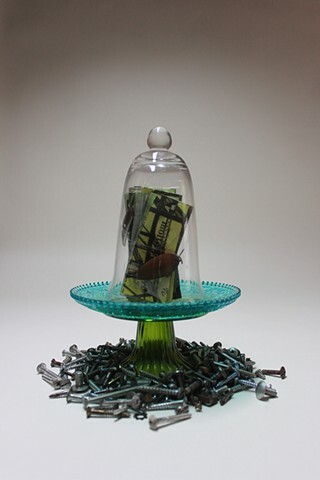 Bell jar, flash cards, fishing line, lures, photos, & bolts. In memory of my Dad, who loved his boat rides off the Branford shore. I over-printed his flash cards (he used to learn Italian) with photos from a boat-ride on the river, then wrapped the memory in fishing line and lures. Bolts from his workshop bind the moments to the earth, while I miss him dearly.